Each box contains 1 Autograph and 1 Pieceworks card! Insert cards include a 9-card "Justice" puzzle set, a 6-card "The Powers That Be" set featuring Clark Kent's extraordinary abilities, a 3-card "Archer's Quest" set featuring the debut of The Green Arrow, and a "Wrath of Zod" case topper card inserted one per case. For every 2 cases (20 boxes) pre-ordered, customers will receive card AJ-A or AJ-B, unique puzzle autograph cards. Card AJ-A includes autographs from Justin Hartley as Green Arrow and Kyle Garner as Impulse. Card AJ-B includes autographs from Alan Ritchson as Aquaman and Lee Thompson Young as Cyborg. 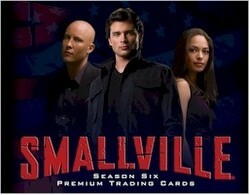 The sixth season of The CW's popular Smallville featured in an all-new premium trading card set from Inkworks. Don't miss out! Contact your favorite retailer to order today. 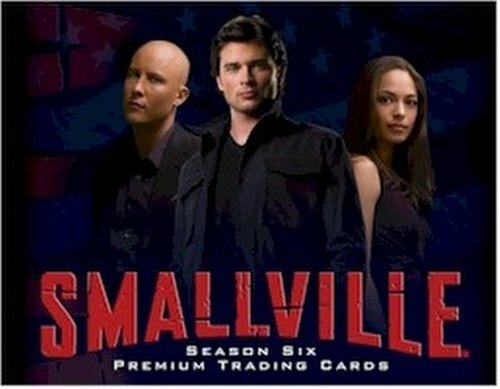 Inkworks announces the January 2008 release of Smallville Season 6 Premium Trading Cards. The new set captures the action-packed story of Clark Kent as he becomes more comfortable with his strength and abilities. The 90-card set includes episodic coverage and new subsets like “Phantom Menaces,” “Faces of Justice,” and much more! PIECEWORKS� CARDS – ONE PER BOX! Eleven different cards featuring pieces of costumes worn on screen during Smallville: Season Six. 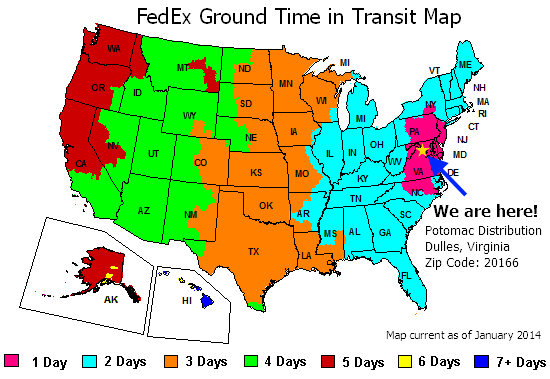 (11 cards inserted approximately 1:36 packs). THE POWERS THAT BE - Six cards that present spectacular images of Clark Kent’s extraordinary abilities. (6 different cards - inserted approximately 1:17 packs). ARCHER'S QUEST - Three cards showcasing the exciting Season Six debut of Smallville’s newest hero, “The Green Arrow’! (3 different cards - inserted approximately 1:35 packs). Look for the exclusive collector album to complete the collection, plus a limited, individually numbered nine-card uncut mini-press sheet! ALLIANCE FOR	JUSTICE - RETAILER PRE-ORDER INCENTIVE - two unique, puzzle	autograph cards featuring the memorable “heroes-in-costume shot”	from the “Justice” episode. Each card includes TWO autographs. Card AJ-A	features autographs from Justin Hartley as Green Arrow™ AND Kyle	Garner as Impulse™. Card AJ-B	features autographs from Alan Ritchson as Aquaman™ AND Lee	Thompson Young as Cyborg™.